The Nile Perch (Lates niloticus) is a freshwater fish belonging to the family Centropomidae. It is native to the so called Afrotropic ecozone, where it was originally found in the Congo River, the Nile River, the Senegal River, the Volta River and Lake Chad. It can also survive in brackish waters and is common in Lake Maryut in Egypt. During the 20th century, it was deliberately introduced to many other lakes in Africa than Lake Chad, since the Nile Perch grows very large and therefore is popular among fishermen. The Nile Perch is a valuable food fish and the fillets are exported to other parts of Africa and to the rest of the world as well. The Nile Perch has also been involuntary introduced to several other parts of the world, and many areas have created rules and regulations regarding the possession of live Nile Perch in order to protect the native ecosystem. It is for instance illegal to possess, raise, sell or buy live Nile Perch in Queensland, Australia. Those who break the rule can be forced to pay fines up to 150,000 AUD. The Nile Perch was introduced to Lake Victoria more than 50 years ago and has since had a devastating effect on the ecosystem. Many fish species have become completely extinct in Lake Victoria, including a large number of endemic species that can be found nowhere else in the world. As mentioned above, the Nile Perch grows really large and is it not uncommon for a mature Nile Perch to be over 195 cm long and weigh over 200 kg. They need warm waters to grow this big and in a tropical lake like Lake Victoria they will occupy all habitats of the lake as long as there is enough oxygen in the water. The juveniles while however only be found in shallow waters, usually close to the shore. The Nile Perch is commonly found in high densities and feed on fish, insects and larger crustaceans. They young Nile Perch fry eat plankton. The Nile Perch becomes sexually mature when it is around 3 years of age, and since it can live for up to 16 years each individual Nile Perch is capable of spawning numerous times and produce an abundance of offspring. They also spawn most of the year and a female Nile Perch can produce up to 16 million eggs at a time. The female Nile Perch commence spawning when she has grown to 50-80 centimetres. When the female has deposited the eggs and they have been fertilized by the male, the eggs are left alone. The Nile Perch do not guard eggs or raise fry. 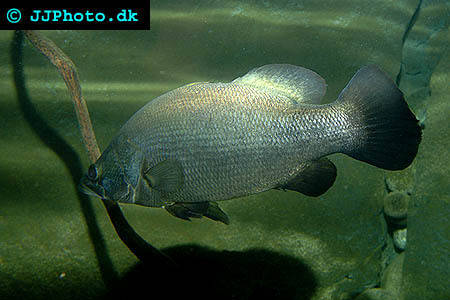 The adult Nile Perch display a silvery colour with a blue tinge. Their eyes are dark and very distinct, with an intensely yellow coloured outer ring. Adult Nile Perch are somewhat similar to adult Barramundi fish, but the Barramundi is not capable of breeding in freshwater lakes. Juvenile Nile Perch are camouflaged by asymmetrical broad markings on their body and a number of dark markings that spread out from the area around their eyes. These markings will gradually fade away as they grow older.